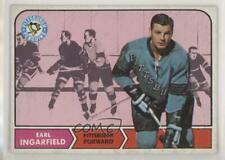 1968-69 Topps Hockey Cards #102, Earl Ingarfield, PSA 7, Really Sharp Card!!! 1968-69 O-Pee-Chee #102 Earl Ingarfield KSA 8.5 NMM+ Pittsburgh Penguins NICE! !